Nestled in the heart of the ‘Quartier Latin’ (Latin Quarter) on the world famous Rue St-Denis, Hotel Le Relais Lyonnais is sure to impress the most discerning traveler. Designed with every detail in mind, Le Relais Lyonnais combines the authenticity of 19th Century architecture with the amenities of modern comfort, all to ensure that your stay with us is a memorable one. The building dates back to more than 130 years and every painstaking step has been taken to keep the architecture and design of the period intact. The gleaming maple floors, the polished wood banisters and spectacular wood details, all combined with a chic décor immediately takes you back to elegant 19th century living. 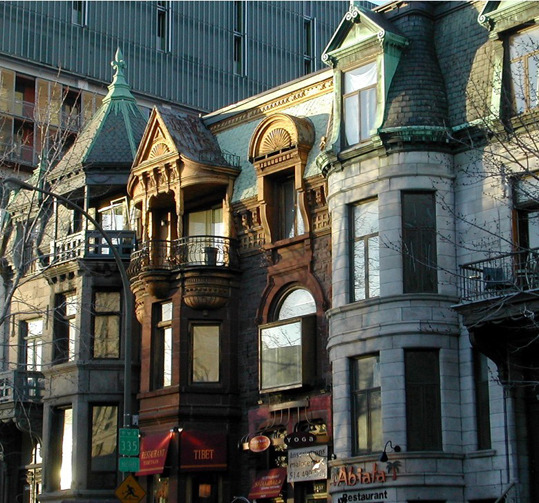 We are situated across from the Theatre St-Denis, the National Film Board of Canada, the Cinemateque Quebecoise and a short walk to the Grande Bibliotheque de Montreal and in close proximity to Old Montreal, le Palais des Congres, la Place des Arts, and the Musee D’Art Contemporain. Secured parking is available exclusively for our guests.